In order to keep ice costs down for our skaters, it is crucial that the NVFSC is involved in a number of fund raising opportunities throughout the year. With the genorisity of our wonderful volunteers and donators, over 50% of our annual ice bill is paid for through fund raising efforts.The cost of subscriptions are held artificially low so more people can afford to skate on premium ice. Our top fund raising efforts include running concession stands for University Concessions for a percentage of sales, the Used Skate & Apparel Sale, and our basket raffle during the spring ice show. We are always looking for new ideas to keep the costs in this expensive sport as low as possible. Throughout the year, NVFSC runs concession stands at various venues (Rec. 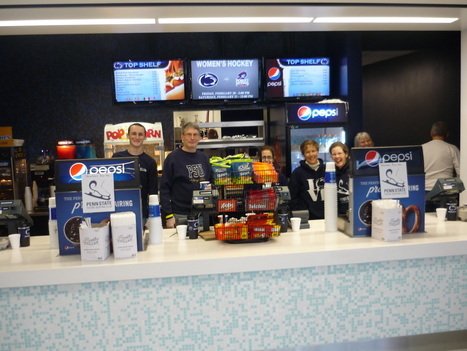 Hall, Jeffrey Field, Pegula Ice Arena) for Penn State University Concessions. To date, running concessions stands is our highest grossing fundraiser. Thirteen percent of the sales from each event go towards NVFSC! ​​​We Are.... ALWAYS in need of volunteers to help run concession stands for various sporting events. If yo​u can work an event, for ANYamount of time, don't be shy! Please drop our Club President, Gary Mitchell an email (n8h@psu.edu). The Nittany Valley Figure Skating Club is a 501(c)3 non-profit organization committed to encouraging participation in the sport of figure skating. Tax deductible donations are always greatly appreciated. Your donation will aide our skaters in achieving their goals. To make a donation, please make checks out to Nittany Valley Figure Skating Club.